Just applicate your invention, secure your application date and care about your invention up to 12 months later. Who can apply for a PRIO-application? We know that you as an inventor has a thousand things to do. You have to have many discussions with many different partners. But before you present your innovations publicly and advertise them, it is important to think about protecting your intellectual property. With a patent application, you are securing the “date of birth” of inventions. However, patent applications have to be properly prepared. That needs time and attention. All details have to be precisely described, and sometimes drawings have to be prepared also. Ultimately, a patent has to be properly drawn up if it is to have any validity. This may present you with a dilemma. You know what you have invented, and perhaps you also have some sketches. But you do not yet have any finished drawings or completed documentation. Maybe you also do not yet know precisely what characteristics you want to have protected. To enable you – in spite of this – to talk about your invention and pitch it to potential customers, and to seek investors, the Austrian Patent Office now offers an addition possibility: the PRIO-application, a provisional patent application. Even if the description of your invention has not yet been completed, you can still register it. With a PRIO-application you are ensuring (as with a normal patent application) the “date of birth” of your innovation – worldwide, for a period of 1 year. You now have up to one year to consider whether you want to turn this into a normal patent application. You decide how you want to use PRIO-application – depending on whether the market opportunities are right and whether your search for investors has been successful. You can upgrade the PRIO-application to a normal patent application at any time, or you can decide no longer to pursue patent protection for this solution. We support you during this twelve month period, providing you with advice, reminders about deadlines, and further information. birth” for a patent application, which you can “take with you” anywhere in the world. You have official evidence to present to the competition that you made the innovation on a aparticular date. You save time, because “patent-conforming” formulations are not necessary until a later stage. € 50. The remaining search and examination fee is only payable if you opt for an upgrade. Anyone may file an application, regardless of whether they are a natural or legal entity (company). You disclose your innovation to us by describing it and enclosing sketches (if these are necessary in order for the innovation to be understood). The description of the invention must in any event be detailed enough for it to be comprehensible to an average person with specialist knowledge. The subsequent formulation of the documents must not go beyond the original description. New parts, new technical aspects or any new interaction which were not previously present may not be added at this stage. For this you would have to start a new application, for which you would be given a new priority date. Business methods, software per se and mere ideas cannot be protected by patent! If it becomes evident that a patent is not the right form of protection, alternatives can be considered in the form of brand protection or design protection. Register the PRIO-application online at efiling.patentamt.at/patente. As soon as you have completed your application, your invention has a “date of birth”. Your application is now held in our “safe”, and you can pitch your innovation or attend to other important problems without concerning yourself at the moment. After about three months we give you a reminder about your PRIO application. Do you know yet whether want to take the PRIO-application any further in the direction of a patent? If so, you can upgrade. An early upgrade has the advantage that you will also get an official estimation at an earlier stage of whether your invention is patentable. You will receive this estimation within six months. This is particularly advantageous if your market is abroad and you also want to have your innovations protected by international patents. On the basis of this estimation, you will be better able to make a decision concerning further internationalisation. If after this three-month period you are not yet ready to make a decision – no problem. Your PRIO-application continues to apply. Eight months after your registration, we send you another reminder. 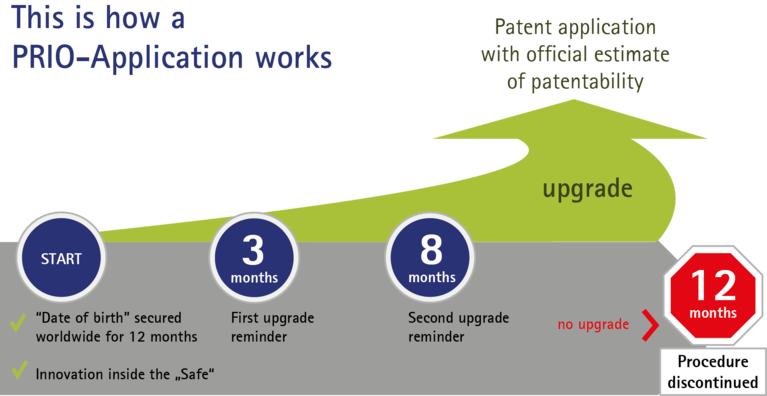 Do you now want to upgrade to a normal patent application? If so, please pay the examination and search fees in the amount of € 272. If there has been no upgrade after twelve months, the application process is discontinued. Please let us know if this page was helpful for you! Notice: After submitting this form you will stay on this page.